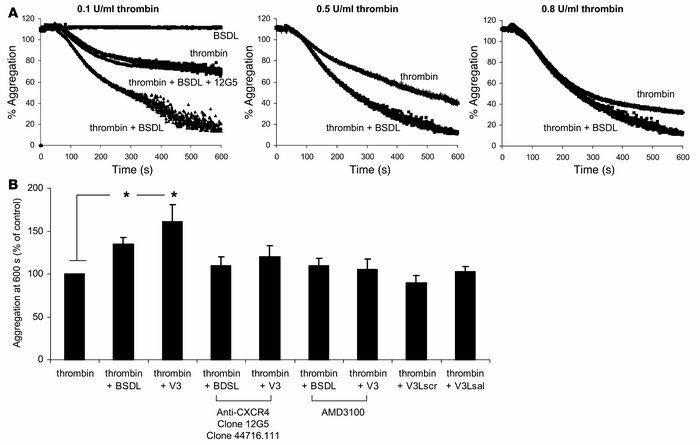 BSDL and V3-like loop peptides enhance platelet aggregation induced by thrombin. (A) Kinetics of platelet aggregation induced by 0.1 U/ml (left panel), 0.5 U/ml (middle panel), or 0.8 U/ml thrombin (right panel) in the absence or presence of 5 μg BSDL. (B) The extent of aggregation of platelets activated with 0.1 U/ml thrombin in the presence of BSDL (5 μg), V3, V3Lsrc, or V3Lsal peptides (1 μg) (n = 10; *P < 0.01) is indicated as a percentage of platelet aggregation in the presence of 0.1 U/ml of thrombin alone. Where indicated, platelets were incubated with blocking anti-CXCR4 antibodies (clone 12G5 or clone 44716.111) or a CXCR4 antagonist (AMD3100) before addition of thrombin.